I am here to tell you that Summer is not over yet! There is still lots of time left to do a household clean-out. 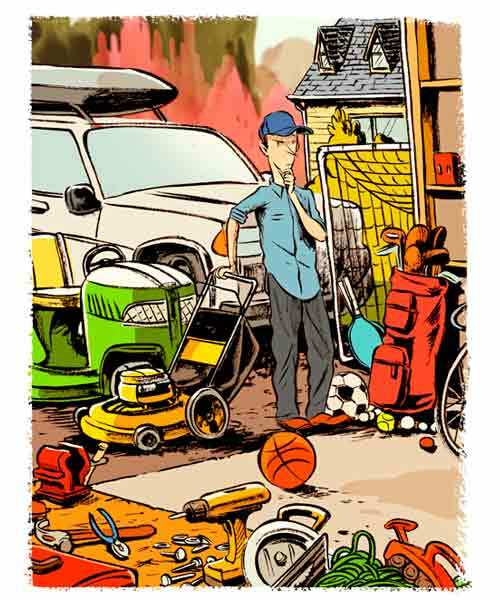 If you can't fit your car into your garage, now is a great time to take a day or two of your stay-cation and get things organized. Let's face it. The minute we buy something it begins to trashify. When the item is new, whether it's a big screen TV or a pair of shoes, it gets a place of honor in your house. It might be on display in your living room, or have a cleared-off spot on the top shelf of your closet. As it ages, it may be replaced by something newer and shinier. Thus, the trashification process progresses. The once-beloved item is moved into hiding - a drawer, the back of a closet, or..... into the GARAGE! Think about the word, GARAGE. Even the word itself is just one letter away from.... GARBAGE! Once an item lands in the garage, there is no going back. So many good reasons to de-clutter that space! If you live anywhere in North Central MA or beyond, including Lunenburg, Fitchburg, Leominster, Holden, Marlborough, Devens, Groton, etc etc., a bin from Bin There Dump That can help with your project. Thanks for reading, and check back again soon for another in this fun video series!